HomeMicrophone ComparisonsBlue Yeti vs. Blue Spark | THE DIFFERENCE? If you were looking for the Blue Yeti vs. Blue Yeti Pro, and clicked on this article out of curiosity, head on over there! Otherwise..
Today I’m comin’ at you in style with a sweet comparison review of the Blue Yeti vs. Blue Spark! Both are good microphones, but they’re very different from one another. Before we get into it, grab a snack, sit back and relax because.. This is a really popular condenser mic, and for good reason. Standing about a foot tall on your desk, it’s got a great sound, is really solid, reliable, and most importantly it’s convenient. I know many of you don’t really want to bother with the whole XLR setup. You just want to be able to plug and play. If that sounds like you, then this may be a great option. Being that the Yeti is a USB mic, you won’t have to tinker around with extraneous gear. Some folks get scared off from USB set ups because they seem cheap and easy, but not satisfying. What you’re getting here is a versatile piece of equipment with great sound quality. Called exceptional, this mic handles a variety of applications very well. I’ve seen it endorsed mostly for Skype, conference calls, pod-casting, you-tube, and any thing that requires voice over. You may not want to pick this up as your primary vocal mic, but it has been known to handle that as well. What I will say is that I believe the Yeti to be first in line in The best mics for podcasting! It also has a very nice build, is made of metal, and feels solid in your hand 🙂 Some have complained that it leaves a rather large foot print on your desk, because of the fact that it stands so tall. Gain control and headphone jack for no latency live monitoring. What is latency? Mic does not actually have an On/off switch. Overall, this is one of the best options you can go with if you’re looking to record with Skype, doing any pod-casting, you-tube videos, video conferencing and any thing similar. I wouldn’t recommend it much for vocals, although it can be done. The 4 different polar patterns, it’s rugged build, and remarkable versatility make it an affordable and valuable option. Max SPL: 128dB. What is SPL? Pairs very well with the Scarlett 2i2 and the Steinberg U22 audio interface. What does an audio interface do? Both do well with pod-casting and voice over type work, and are also quite versatile in that they can handle a wide range of genres. Both are made by Blue Microphones. Both have a nice build and good sound quality. Aesthetic. The Blue Spark has a baby bottle quality to it, and looks radically different from the rounded off, somewhat tube shape of the Yeti. Connection. The Blue Spark is an XLR mic that requires 48v Phantom Power. By contrast, the Blue Yeti offers simple plug and play by way of USB connection. Application. The Blue Spark uses a more traditional set up, utilizing a standard mic stand outfit. The Blue Yeti simply sits on your desk. Protection. The Blue Yeti requires a separate windscreen, while the Blue Spark uses a traditional pop filter. When starting out, it may be tempting to go with the USB option. I can definitely see why. It’s convenient, there are no extra necessities you have to worry about, and there are some pretty great models out there that deliver a more than adequate sound! If you’re doing voice over type stuff, The Blue Yeti USB will give you the results you’re looking for. The downside is cost. You’re in essence sacrificing price for convenience. 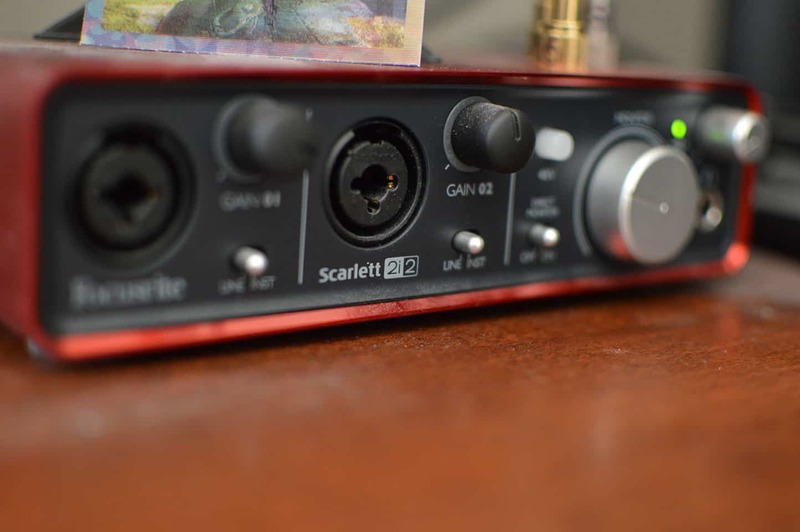 The trade off when you buy an XLR mic is that sometimes the cost is lower, but you’ll have to spend that extra dough on essentials like an audio interface, XLR cables, etc. Your audio interface. If you need a mic to record your voice or lay down some simple tracks, USB may be the way to go. If you’re looking for better sound quality, an XLR mic may be your best bet. Some benefits include being able to record vocals and instruments, as well as being able to power a good pair of studio monitors. What are studio monitors? You can also hook up a MIDI device as well, so long as the interface has MIDI capability. What is MIDI? It’s more of a long term investment, as you can upgrade your mic and have a lot of different ones to choose from. For a great pair of entry level monitors, check out my JBL LSR305 Review! It really depends on your needs when deciding which of these is more suitable. Do you want an XLR set up that requires 48v phantom power? Go with the Blue Spark. SEE THE BLUE SPARK FOR YOURSELF ON AMAZON!! As far as sound, both mics are very comparable and do well in a lot of the same applications. The Blue spark was more endorsed for vocals than the Blue Yeti. Both mics more than deliver results when it comes to voice over type stuff. Well that’s about it for today my friend! I hope you’ve enjoyed my Blue Yeti vs. Blue Spark comparison review!! So what do you think about these 2 microphones? Which one would you be more likely to go with? Let me know!! I have been thinking about starting a pod-cast for my site and couldn’t come with right tools to use especially mics. From your detailed review, I think I’ll go with blue yeti. Hey Aba! The blue yeti is quite a nice mic. Glad you’ve come to the right decision!! I’m looking for a mic to start recording some of my acoustic covers and Blue Spark sounds just right! My voice is somewhere between medium-high pitch so I tend to sing higher when stretching vocals, will that be okay with Blue Spark or should I go for Blue Yeti? Yes the Blue Spark does well with medium to higher pitched voices. Sounds like it may be the mic for you. If you don’t want to invest in an audio interface, the Blue Yeti may be more convenient as it’s USB plug and play. It’s a great all around mic as well. Great review! A Mic was one of the things that I was looking forward to get, and this content was helpful for me. I just couldn’t decide which is better. It’s a hard choice to make. But i will be keeping this information in mind. But for me Blue Yeti seems to go better with me. Thank you! Glad to be of some help. Let me know if you have any questions.. Hope you end up making the right decision..
Been looking to build out a home office for my blooming internet business and YouTube Channel. I really like the look of the Blue Yeti and it’s pros. Where I am concerned is the lack of a power switch on it. Is that controlled through the computer or is it just always working when plugged in? Yeah unfortunately the mic doesn’t have one. It instead powers on and off via the USB cable, so I’m assuming even if it’s plugged in and you shut your computer down, it will power down as well. An awkward flaw in an otherwise stellar mic. You would think since the mic itself has like 80 different features (lol), they could include a power switch? Oh well. Glad you stopped by. Come back again anytime! I’m looking to get the Yeti Pro and doing more narrative, voiceover work. Would this microphone be a good option? Glad that I stumbled upon this article, I liked the way you reviewed it. My query is did you ever compare the zoom h2n vs blue yeti. No would you like me to do a comparison article? That would be great, because there are very few who compared but the way you do is just phenomenal. Sure man no problem! Contact me so I will know when to alert you. 2. The Scarlett sounds better with spark? Not Blue icicle? I would just mess around with the gain until you reach a level that doesn’t clip, but yet still sounds full and loud enough. I’m not sure what other settings you mean? Let me know. As for your other question, I wouldn’t worry too much about what you hook it up to. The UR22 and 2i2 are both great pairings. As for the Icicle, yeah it’s pretty good, but a little hit and miss as far as issues are concerned. You may be better off investing in something more solid, as a good audio interface will last you a long time work well with many different microphones should you decide to upgrade.